Squishy Kiosk is a brand new online store that sells loads of super cute squishies. What is a squishy? I hear you ask. If you have kids you might already know as they are becoming really popular over here in the UK. A squishy is a foam toy that comes in all different designs that you can squeeze as much as you want and it will slowly inflate back to it's original size. They are really satisfying to play with. When Squishy Kiosk asked us if we wanted to review some of their products I jumped at the chance because I know my niece Lilly loves these. We were asked which ones we wanted and I told them that we didn't mind but that I love penguins and Lilly loves unicorns. The squishies arrived wrapped up nicely in little bags in a box and came with a card and also a really cute little card to say our order was packed by Roy. I was actually surprised at the size of the squishies as I thought they would be much smaller. They fit well in the hand. Lilly came over and she loved the squishies. She especially loved playing with unicorn on the moon she loves squishing the tip of the moon. She took the two home and I kept the penguin. I really love how the back of the penguin is so soft. 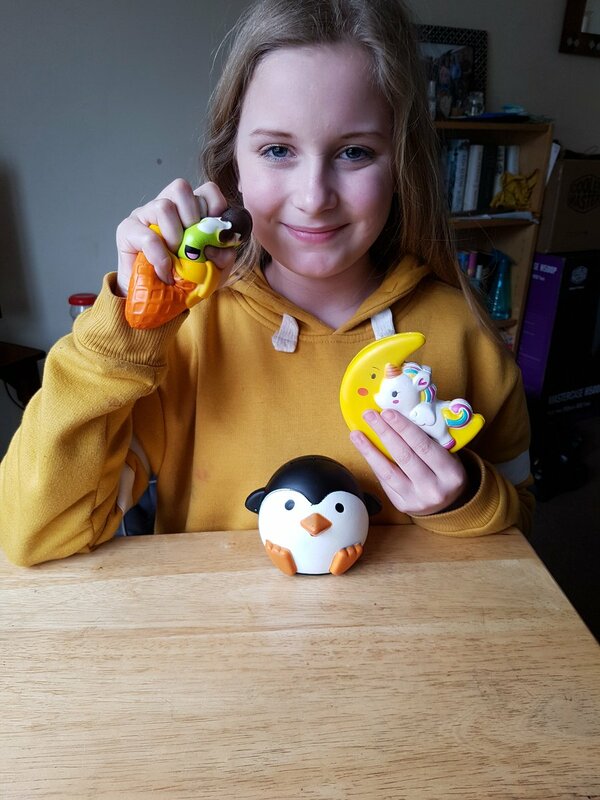 Lilly really enjoyed browsing the Squishy Kiosk website and looking at all the cute designs and is planning on buying more in the future. There are so many cute designs to choose from. We definitely recommend squishy fans to check out the Squishy Kiosk site - and they offer free shipping worldwide too! 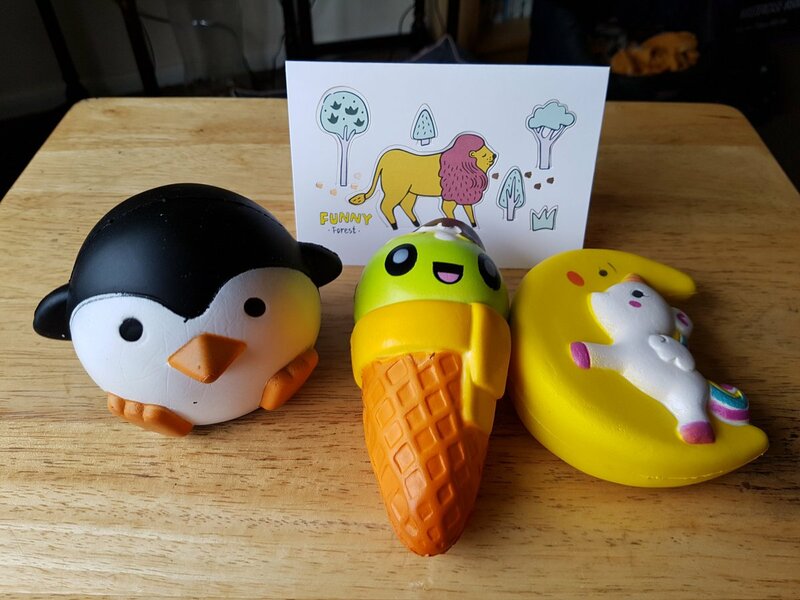 Our friends at Squishy Kiosk has kindly offered one of readers the chance to win a surprise box of Squishies. This giveaway is open worldwide and to enter you just need to follow the steps in the gleam widget below. Good Luck! Disclaimer: The squishies were sent to me for the purposes of this post. All opinions are my own. These looks great collectables - my little ones would love them! Oh the unicorn moon one is my favourite - what a cutie! These are fab! My Daughter loves them! wow my little girl loves these things!!!!! I love the rainbow unicorn! The penguin is my favourite squishy :) Thanks! My daughter loves the Cream Puff Emoji Squishy Charm! I must be hungry as the Chocolate Kiwi Double Scoops Ice Cream Squishy looks particularly appealing. Oh my god our kids are into these it’s all they have talked about all week. I’m all for it the slime craze is on its way out!! UNICORN MOON WHATS NOT TO LOVE ABOUT UNICORNS! My niece is obsessed with these! My daughter loves these. The penguin is my favourite. Omg, i love so much the unicorn flying to the moon but the penguin is so cute too. Omg, i love so much the unicorn flying to the moon, but the penguin is cute too, help. I'm glad you liked these. They're really cute. The Unicorn Flying To The Moon Squishy is my favorite squishy from the review package. Squishes are wonderful for stress relief + I especially love the yummy scented ones. My favorite of the 3 would have to be the unicorn - what great details! I like the Squishy Ojipan Panda Charm the most. I love the Unicorn on the moon squishy. My girl would love this a lot! The penguin, my boy adores penguins - so cute! thank for this giveaway.Fantastic giveaway!loves the unicorn! The unicorn one is my favourite! The penguin is my fav! The pink chipmunk is my fave! 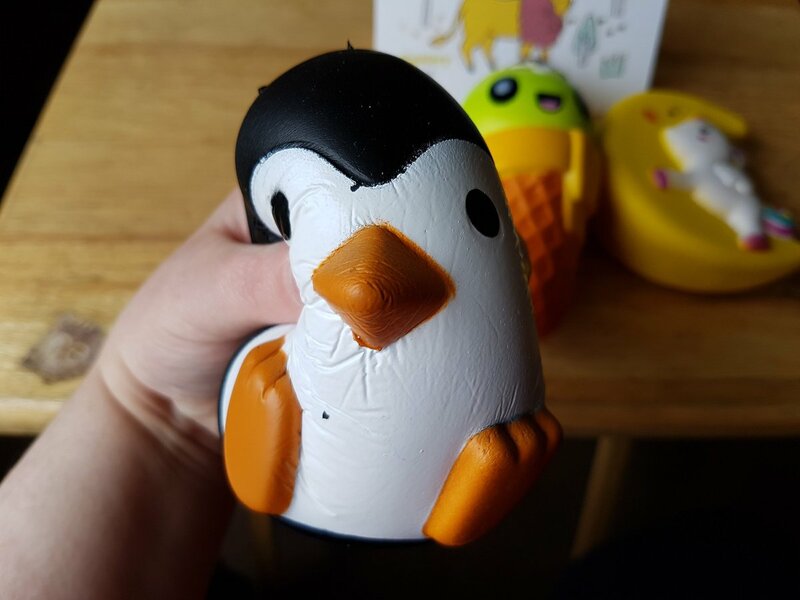 the squishy penguin is the best one! !